One of the most important crop formations of 1992, appeared just north of Silbury Hill, Wiltshire (SU.094690) on the night of August 17th . It was called the "Charm Bracelet." Anthropologist and crop circle researcher, Michael Green, wrote a brilliant article about the formation, calling it a "Dharmic Wheel." The title of the article was, "An Archaeological Approach." The meaning of the formation has similarities to the huge Sri Yantra pattern that appeared in a dry lake bed in Oregon in 1990. 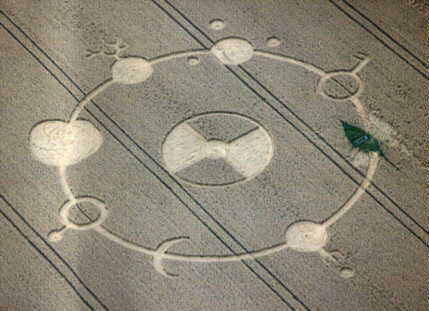 Michael Green was the Chairman of the International Centre of Crop Circle Studies. In 1992 he was preparing a study of the crop circle phenomenon as symbols of spiritual development under the title, "The Celtic Zodiac." His chapter, "The Rings of Time" in The Crop Circle Enigma elaborates on the Dharmic Wheel. I first read the article at the end of March, 1993. It was in the first issue of the Center For Crop Circle Studies California Quarterly Journal. The (first) California branch of the CCCS was very short lived. I believe that there were only two issues published. The article was also in one of the major crop circle journals sometime later. Michael Green said in the article that the formation is in the tradition of the great instructional mandalas which had previously appeared, such as the 1991 Barbury Castle formation and the Mandelbrot formation at Ickleton. The Barbury Castle formation, he said, expresses "the etheric structure of Deity. The Mandelbrot formation represents the etheric structure of Gaia, that is, Mother Earth. The Dharmic Wheel formation is about human spiritual development. It is similar to Indo-Aryan symbols, called "The Great Turning" in prehistoric Europe. In the East it was called, "The Dharmic Wheel." The structure of Ultimate Reality has the eight symbols of Being and Becoming on the points of the directions. The various glyphs had appeared as separate crop formations elsewhere in the Wessex area of England. In the center of the formation was a ring with a dot inside, which symbolizes Deity. It is further defined as the manifested state of God by being quartered. To the Celtics, this was the god, Bel, the Light behind the Light. 1. South - The antlers of Cernunnos - the role of the Animal Powers in the physical development of mankind. 2. Southeast - Modron - The Earth in the nurturing role of the archetypal Mother. This is the energy of consciousness. 3. East - Dagda - Procreative power, a sexual glyph, the mahadiva. This speaks of the spiritual conception. 4. Northeast - Sulis - The crescent moon which constitutes the womb of spirituality and the individuation of the personality. 5. North - Taranis - His wheel, with the three-fingered hand of blessing, which is also a claw, for this is the energy of conflict between the personality, soul and spirit. It represents the confrontation between the Soul and Personality. 6. Northwest - Lugh - Archetype of inspired knowledge. Note: This symbol did not appear as would be expected in a Dharmic Wheel, because the formation was positioned in such a way that a water through (for cattle) was located at that point on the ring. In some photographs of the formation , such as the one at the top of this page, the area appears dark because the water made the plants greener in that portion of the field. It could be that the pattern was positioned in this way for a purpose. My guess is that the "water," and perhaps the "cattle," are symbolically related to our "inspired (or uninspired) knowledge" at this time. Michael Green felt that Lugh had lost his symbol due to the water through, which destabilized the energies. 7. West - The ring and key of Mapon - The Divine Youth symbolizing the emergence of the spiritual being who unlocks the door to the Mysteries for others. 8. Southwest - The place of Donn - The triadic symbol of Spirit, Soul and Personality brought together finally as one Unity. The place of Donn is the archetype of death and transformation. At this point, spiritual maturity has been fully achieved. Further incarnations on the Dharmic Wheel are then unnecessary. The transformed Spirit of Light moves to the Center, symbolized by Bel, for further development in a different sphere of reality. It is a story of dreams and coincidences that came like puzzle pieces into a meaning. A central part of the article speaks of a coincidence involving the Sri Yantra pattern that appeared grooved into a dry lake bed in Oregon in 1990. It was huge, with 13.3 miles of lines. The point I want to make here, is that the Sri Yantra has similarities to the Dharmic Wheel. 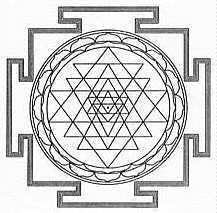 I read about the meaning of the Sri Yantra in a book called, The Tantric Way, by Ajit Mookeajee and Madhu Khanna. The Sri Yantra shows a path through the chakra levels from outward, inward. The square shaped outer section has four "T" shapes, which are said to be gates. These type of mandalas are aligned with the directions, which was also the case with the lake bed pattern. The first step, through the gates, symbolizes the first chakra. This is followed by a 16- petaled lotus flower as the second chakra, then the 8-petaled lotus as the third chakra. The next several steps or chakra levels involve the complex star shape formed by overlapping triangles. The fourth, or Heart Chakra, is symbolized by the 14 points around the star. The path continues to the eighth step/chakra, which is symbolized by a single triangle. This is quite similar to the eighth step on the Dharmic Wheel, which is the triadic glyph. The final, or 9th step, is to the single dot in the center, called the Bindu, the "Light beyond all colors." This is very similar to the "Bel" interpretation of Michael Green, as the "Light behind the Light." In The Inner Reaches Of Outer Space, Joseph Campbell wrote of the universal symbolism of the chakras, shown in various forms. Traditionally, there are seven chakras associated with the human body. The chakras are the points where the soul is said to attach to the body. There are, however, more advanced chakras beyond the human form. There is strong evidence that some of the other crop formations are symbols of the chakras. I feel strongly that the Universe is trying to tell us something. For the most part, these strange formations appearing on our planet are not being made by the human specie. The very same messages are coming through dreams and coincidences. I do think it is time to wake up and pay attention with an open mind and an open heart.